Hellokids has created a lucky Leprechaun Hat and Shamrock stencil templates to use during St. Patrick's Day. 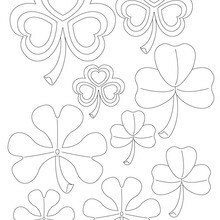 The Shamrock and Leprechaun Hat stencils are fun to use as a family activity to make decorations for the house during St. Patrick's Day, for schools to decorate the classroom or hallway, or a festive St. Patrick's Day party. You could even use the Shamrock and Leprechaun Hats to write riddles on for a fun scavenger hunt activity. 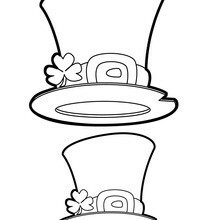 Print your Leprechaun Hat and Shamrock template on cardstock paper, color with all your lucky crayons, markers or paints, then cut out. There are many fun ways to use stencils and the Shamrock and Leprechaun Hats is the perfect craft for a fun decoration this St. Patrick's Day.